After our bad experience at Mazarrón we decided to head down into Almeria province. We decided to stop off for a couple of days at a Spanish family run camper stop called AC Indalo just outside the town of Vera. 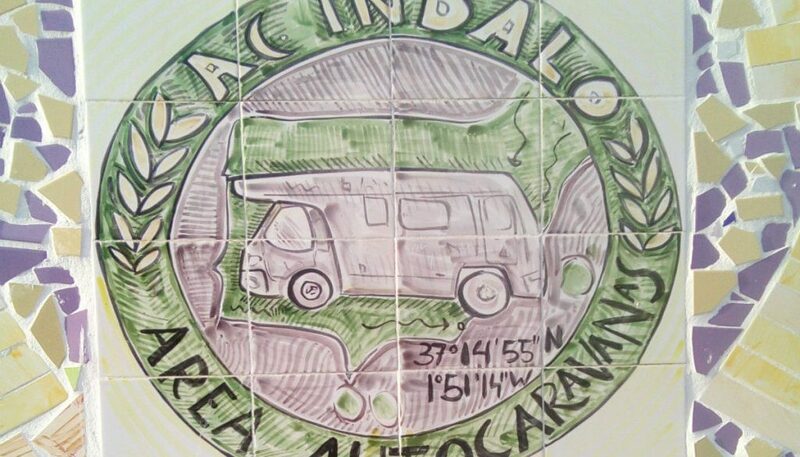 The AC in the name is for “auto caravanas” (37.2614261, -1.8537881). The campsite is located at the back of the tennis and padel club Indalo and also has a micro-lite flying school complete with tarmac runway for the brave amongst you. We checked in for two nights which cost €11 per night including electricity (€9 without) and headed up towards the plateau as instructed, where the larger vans were. We were told to just pick a spot, park up and plug in – I have no idea how they know where anyone is parked or whether they are plugged into electricity – the only information they took was my passport and our registration number and the pitches on the plateau weren’t numbered. The site is on three levels with the first two levels being laid out in terraces with good sized pitches. Right up at the top is a large flat area where the larger vans are. The views from this large gravel area are incredible. Gone are the lush green fields of vegetables and fruit, as far as we can see the landscape is very dry and arid. I wouldn’t be surprised to see Daenerys Targaryen flying overhead on a dragon. There’s a slight wind but the weather is warm. There are about 20 other large vans up here with us (including one that a car drives into the rear garage!) but there seems to be a quicker changeover here than at other parking spots we’ve been to. There is a cafe/bar down at the entrance which serves food and drinks until 23:00 at very reasonable prices. They have “specials” nights and make Paella on a Sunday which costs €6. The service is a bit chaotic to say the least, with the waiter retaining everyone’s order in his head – but somehow they manage to make it work. Originally we were only going to stay for two nights but we were still there after a week. We took the bicycles into the main town of Vera for a looksee. Vera has several buildings of architectural interest, the main Plaza Mayor (square) houses the 15th century Church de la Encarnación, originally built as a fort to protect against the moors, it’s an imposing building with its 4 great towers and the interior is supposedly no less impressive with a wonderful altarpiece – a fact we will have to take Wikipedia’s word for since it was closed the day we visited. A smaller building nearby had previously been a convent but has been renovated several times and is now the local concert hall. We ended on up to another square where the Royal Hospital of San Augustin building is situated. It has lovely wrought iron balconies and is currently undergoing renovations. There was a small bar/restaurant called Pepes so we stopped for something to eat. I thought a sandwich mixto was a pretty standard item in Spain – a ham and cheese toastie. Not in Pepe’s. As you can see my toastie was somewhat deconstructed but very tasty all the same. There was a sign up for Migas which is a Spanish peasant dish made with garlic, chorizo, peppers and breadcrumbs and something which Alan has been dying to try since he saw Rick Stein sampling a dish in the Extramadura region of Spain on TV. Sadly Pepe’s Migas wasn’t a gastronomic success. It was all a bit bland, in fact for the first time ever in Spain we were able to say “not enough garlic”. So we’ve decided to make our own version just as soon as we get the time. During our time at the site we met a lovely guy called Mark Furniss who is planning to open a new campsite in the area within the next year. We talked at some length with him about the facilities he was going to have and the ones we thought thought he should have. So this time next year we are expecting a new site with huge pitches, EHU, scalding hot showers 24/7, fresh bread delivered daily, etc etc. Mark left with a list of Facebook groups to join as well as some suggested camper stop websites he might like to advertise in. We plan to stay in touch and hopefully be amongst the first to stay at his new site. Watch this space. It never ceases to amaze me the animals people bring with them in their motorhomes, The day before we left a van pulled in and three – yes, THREE Irish Wolf Hounds jumped out of the back. It wasn’t a particularly huge van and they all seemed to sleep inside. I can only imagine the scene. Having had enough of campsite life for another few days we decided to head down the coast a bit towards Cabo de Gata which is a National Park. The guide books promise stunning scenery and impressive coastlines – we’ll see. Wow, beautiful and big Kelpie! And what a view! Nicer than the office!